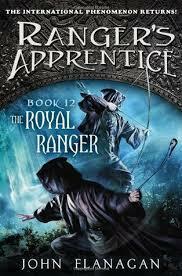 The Royal Ranger, the twelfth book in the action packed Rangers Apprentice series by John Flanagan, exceeded my expectations as an awesome book. The story takes place in medieval Araluen, a mighty kingdom, that has an elite group of men called rangers who are trained with knives and long bows to protect the kingdom from serious enemies. The twelfth book took place several years after the end of the eleventh book, but I quickly caught up with what was going on. Will, the main character, craves the opportunity to kill the gang of criminals who burned down an inn with his wife inside. Will is part of the rangers and has become morbidly obsessed with killing the gang. To stop Will’s mindless anger the ranger’s leader, gilan, forces him to accept a new apprentice, the princess of Areluen. The princess is a rebellious teenager who wants freedom and when she hears that she can become an apprentice to her normally awesome god father Will, she accepts the deceptively enjoyable looking time in the woods. After the nine months in training she has lost her princess ego, found that apprenticeship as a ranger is less appealing than it looks, made Will less depressed, and saved ten kids from slavery. Royal Ranger was an amazing book that I enjoyed very much. It was an excellent book and I deeply enjoyed reading it while the annoying princess lost her ego and self-prestige. The book had just the right measure of action while at the same time keeping the reality of the middle ages. I also liked that the areas were some what similar to actual places like Skandia being Scandinavia while the Scotti were the Scottish and Araluens being Aralen. This book is excellent for anyone who enjoys books with a lot of action and excellent writing.